This recipe is: Raw, gluten-free, dairy-free, soy-free, nut-free, vegetarian and vegan. One of my favorites! Also known as “Homemade GU”. I am absolutely obsessed with this recipe! For my longer workouts (i.e. runs lasting longer than 1 hour), it is CRUCIAL to replenish lost electrolytes. (Read more about The Importance of Electrolytes here). I say “crucial” because in the Texas heat, it truly can be a matter of life or death. Even without the heat, it is still extremely important). Not only will replenishing lost electrolytes make you feel better, but you’ll get a better workout in, as you will abe able to avoid hitting “the wall” as they call it, when you run out of energy. There is a popular product on the market called GU that I normally would eat in order to provide my body with the electrolytes and carbs that it needs to push on. However, I hate the artificial ingredients it contains and it actually makes my stomach hurt. The ingredients in this recipe are truly delicious. The main ingredients are dates, agave nectar, coconut oil and hemp protein, and the combination of these glucose- and fructose-rich ingredients is the best answer for a quick, easily digestible, high-energy snack. When the body runs out of simple carbs to burn, it will turn to complex carbs, which consume more of the body’s energy to break down before they can be used as fuel. This gel is easily digestible, and the carbohydrates here will get to the working muscles super fast! Fructose has a lower glycemic index than glucose. This means it kicks in at a slower rate once consumed, and it burns more slowly, prolonging its effectiveness. This is where the agave nectar comes in. Coconut oil is a rich source of medium-chain triglycerides (MCTs). This form of fatty acid is excellent for quick energy, as it goes directly to the liver to be burned as fuel (just like glucose). All of the ingredients above are fantastic for shorter, high-intensity workouts. However, for a longer workout, hemp protein is included in the Coconut Carob Gel because the protein will slow the rate at which you burn through those simple carbs, prolonging energy levels. I am so thankful to have found this amazing, all-natural recipe in the Thrive book. 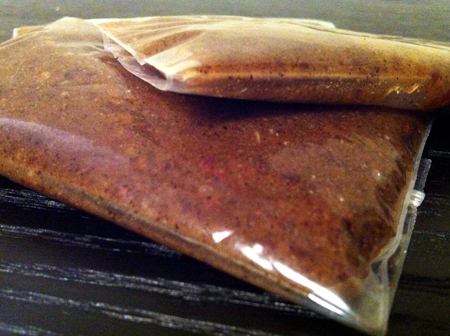 Now I eat some of this “homemade GU” before every workout, no matter how long it’s going to be! Recipe yields: ~ 3/4 c., about 8 oz. In a food processor, combine all ingredients; process until blend reaches a gel-like consistency. Save the gel in reusable flasks, or in small zip block bags. If you use the small zip block bags, you can cut the corner of the bag off, and squeeze the gel out of the corner of the bag. Very easy while you’re working out! The gel will keep up to 3 days in the refrigerator, but is best when consumed fresh. Enjoy!